A view from An Carn (hill north of Bridgend) north across the dunes at Ardnave looking far out over the Atlantic. 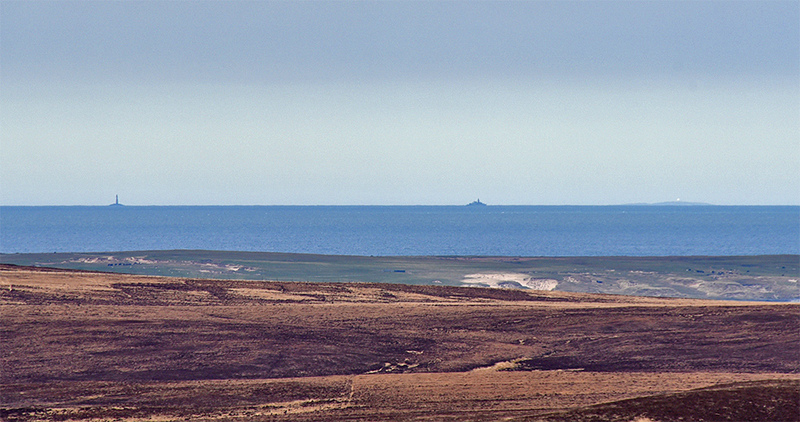 On the left is Dubh Artach lighthouse, just right of centre a warship (there was a NATO exercise taking place when I took this picture during the Islay walking week in April 2016) and to the right a distant island. I’m not sure which island this is, I think it might be Tiree. This entry was posted in Cloudy Weather, Landscape, Lighthouses, New Post and tagged An Carn, Ardnave, Atlantic, Dubh Artach, Islay by Armin Grewe. Bookmark the permalink. It was pretty amazing. I’ve seen Dubh Artach before, but rarely so clear.